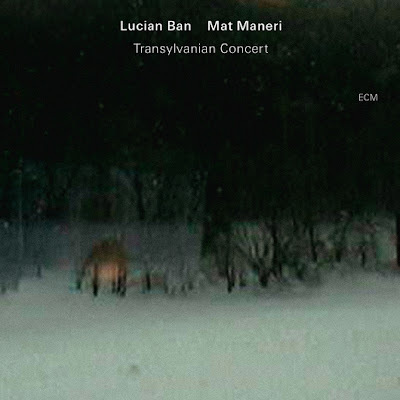 ‘We started playing and the music just flowed’ is Romanian pianist Lucian Ban’s recollection of his first collaboration with violist Mat Maneri (on a reorchestration of Enesco’s Third Sonata) and such spontaneous fluency characterises the seven pieces that make up this recording of a duo concert, performed in 2011 not far from where Ban grew up. Both men are equally at home in freely improvised jazz and structured chamber music settings, and Ban himself stresses the extemporaneous nature of their performance – ‘Mat and I have a telepathic understanding … and much of the music takes shape as we play it’ – but in this hour-long concert the shape of each composition (four by Ban, two by Maneri and one co-written piece, ‘Darn’) is readily discernible throughout the – often wildly imaginative – improvisations to which it gives rise. Ban’s pieces, which include everything from a delightfully sophisticated blues to the hushed reverence of the closing ‘Two Hymns’ are stately, even sombre, but open up in the duo’s hands to accommodate the extraordinary virtuosity of both players, Maneri’s darkly abrasive yet surprisingly agile and fluid sound complementing the elegant, occasionally downright mellifluous piano of Ban perfectly. Admirers of Maneri will welcome the inclusion of a Joe Maneri Quartet staple, ‘Nobody Knows the Trouble I’ve Seen’ (a solo feature) but the bulk of the duo’s concert set consists of Ban pieces specifically tailored to Maneri’s sound and approach (Ellington’s writing for Harry Carney is the Romanian’s template), and its resounding success is a testament to the profound musicality and mutual sensitivity of each man.